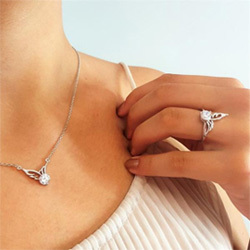 This elegant and delicate angel wing charm necklace provides a deeply meaningful way to honor and commemorate the life of a loved one. The inscription on the pendant reads: »Goodbyes are not forever. Goodbyes are not the end. They simply mean I'll miss you … Until we meet again«. A thoughtful sympathy gift for someone who is grieving or a remembrance bracelet for yourself. I love it, this is for my dad and it means so much ty! Got this for my dad. He was my hero and best friend fits perfect for him thank you! I gave the necklace to a good friend who has just lost her husband. She absolutely loved it. She cried when she read the inscription. She put it on as soon as I gave it to her and I have seen her wear it ever time I see her. Bought this as a gift for our friend who recently lost their loved one to cancer. I bought it for a gift for a friend who lost her father. She loved it & said it was perfect! The look & quality definitely exceeded my expectations. It was perfect. I have a tattoo on my shoulder and it has date and says until we meet again. It's in remembrance of my mom and dad. I got this necklace in memory of my infant son. I have pleased with the necklace . This was a gift and I don't know how it fit but she loved it. I know in my heart I will see my daughter again. Love this necklace so much! Was looking for something in memory of my sister who passed away 5 years ago. This is perfect! Very pleased with my purchase. Have recommended your web site to several people looking for items such as yours. I had a wonderful experience with you. I had originally received a defective item. Once informed you of my item, you rapidly replaced my defective one. I was quite impressed with the short wait time between your response and me receiving the replacement in the mail. Thank you so much for everything! !